The last thing students want to think about in July is their rapidly dwindling freedom from the shackles of those hallowed halls, but it’s time to start thinking ahead to the fall semester. Apple on Tuesday launched the latest incarnation of its annual back to school promotion. 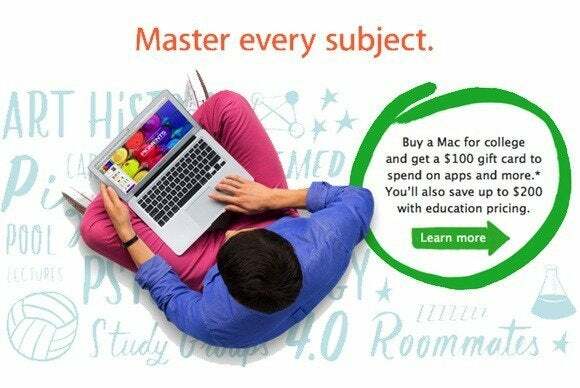 When customers purchase a Mac for college, they’ll receive a $100 App Store Gift Card, alongside the usual educational pricing discounts—up to $200—that the company offers. As with last year, customers can also pick up a $50 gift card when they buy an iPad, and, for the first time, the iPhone is included in the promotion as well. Like its tablet sibling, the smartphone will come with a $50 gift card to spend in the App Store. The downside to purchasing an iOS device, however, is that customers won’t see the same discounts that they do on the Mac—Apple doesn’t reduce the price of iPhones or iPads for education individuals. To qualify for the bonus, customers need to purchase the Mac, iPad, or iPhone from one of three qualifying sources: the Apple Online Store for Education, an Apple Retail Store, or an Apple Authorized Campus Store (excepting the iPhone, which must be purchased directly from Apple). In addition, they also need to be either a college student, a student accepted to college, a parent purchasing for a college student, or a faculty or staff member at an education institution. And lest you worry that you need to blow that $100 on apps, keep in mind that the card is also eligible for purchases from the iBookstore, iTunes Store, and Mac App Store as well. That’s a healthy mix of books, movies, music, and apps to keep your leisure hours filled during those rough college semesters.